2. There may be some indicators within library databases. Most publications in "Academic Journals" have been peer reviewed. Note, however, that editorials, news items, and book reviews do not necessarily go through the same review process. A peer-reviewed article will be longer than just a couple of pages and have a bibliography. 3. In many library databases, the journal title may be linked, as shown below. Clicking on it takes you to a page that may indicate whether the journal is scholarly, academic, peer-reviewed, or refereed. 4. 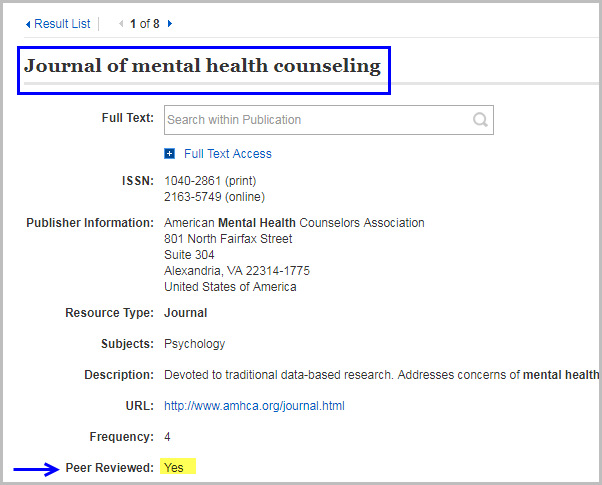 The publisher's website for the journal should also indicate whether articles go through a peer review process. Find a page like "For Authors" to locate this information.